Like any other kid of his age he does his share of mischief. The biggest problem with him is his inquisitiveness. I know that’s good but what if someone needs to know how it feels to lock Mummy in the bathroom. Yes that nightmarish thing happened to me during the time when we just shifted base and was staying with my parents. I am very scared of such mishaps around children and always prefer to make the house child safe. But that was only for a very small period of time and we always have full time house help. Still such a bad incident took place on a lonely afternoon when the househelp took a half day break and parents were on work. the brat suddenly woke up from his afternoon nap and decided to excite himself by just locking the bathroom door from outside. That was the most scariest one hour of my life when I pleaded the little one to try and open the door just the way he locked it and he kept on trying and saying ‘Hochhe na, hochhe na (Its not working)’. Finally the watchman had to break a lock and a door to save us. Anyways let me get back to today’s recipe for now. 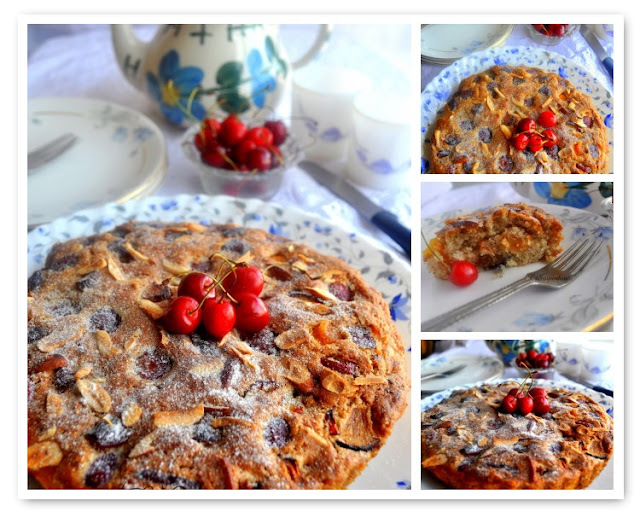 I got this idea of stonefruit cake from the blogosphere. When I saw this light and pretty tea time cake with all those fruits peeking from it, I knew I have to make it. Stonefruits are not very easily available here and this is the first time I tasted plum. Somehow this fruit never appealed to me when I was in Bangalore and I hardly thought about putting them in my weekly grocery bag. This time too I only bought one piece to bake with but that was so juicy and sweet, next day I went back to the shop and bought a huge batch. Also this is the first time I have baked a cake with flaxseeds. Every other day you see articles about the goodness of these seeds and trust me it truly stands to its name of vegan egg. You just have to soak some flaxseed powder in water for half an hour and at the end of this time you have sticky vegan egg ready for your baking spree. If you have been reading my blog you must have noticed that am not much eggless bake person but now am a believer and I really dint miss the egg in this cake. The only thing am skeptical about is the little soggy bits around the fruits. As I already said I made it for the first time and have never ate it elsewhere so am not sure if that’s normal with fresh fruit cakes. I would definitely appreciate your comments on this. If it’s a fiasco please tell me how to overcome this as I want to bake this again and again. Few almonds to sprinkle on top. If you get flaked almond use that. Soak the flaxseed powder in little water and keep covered for 30 minutes. Dry roast the almonds till they are a couple of shades darker. Cool and grind to a coarse powder. Peel the skin, stone and chop the peach in small cubes. Chop the plum, apricot and cherries in similar manner (don’t peel the skin). Chop the almonds in small pieces. Oil one pie tin or a round cake pan (I used one 8” pie tin). Preheat the oven at 180C. Mix in the flour, almond powder, baking powder, baking soda. Keep aside. In another big bowl cream the sugar with the oil and then pour in the flaxseeds mix and vanilla essence. Mix everything well. Add ½ of the dry ingredients to this and fold to incorporate well. Pour in the buttermilk and mix. Finally fold the rest of the dry ingredients. Take little bit more than half of the batter and spread it on the prepared pie tin. Scatter the fruits on top and then roughly cover the top with the remaining batter. I used few cherries on the top to make it look pretty. Also sprinkle the flaked almonds on top. Bake for 35-40 minutes or until a toothpick inserted comes out clean. Cool completely before slicing. Sprinkle powdered sugar on top and serve. I could not follow this as it looked so pretty that I wanted dig in just the moment it came out of the oven. Trust me the pictures are not doing justice to it as its very cloudy here and we hardly get good light to click. It says good for a day in the fridge. But tastes best when eaten fresh. I don’t know why but most of the recipes I checked on net used much more fruits than me. But I found it difficult to incorporate more fruit than this with the same amount of batter. If you could figure out how please go ahead and add more fruit. Let's Cook; break time snacks at Tickling palates. 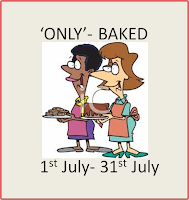 Pari's 'Only' baked hosted at Tamalapaku this month. Meeta's Monthly Mingle: Stonefruit, hosted this month at Sips and spoonfuls. Eggless bakes, flax seed in bakes, how to bake with flax seeds, tisi, eggless cakes, how to bake without eggs, eggless cake, fruit cake, plum cake, best eggless cake recipe, egg less, fruit and nut cake, almond meal, how to make almond meal, flax egg, fresh fruit cake, tea cake, coffee cake, tart pan cake, light cake, prettiest cake ever, light cake, perfect tea time cake, snack cake, peach cake, cherry cake, cherry and almond cake, apricot cake, dried apricot, castor sugar sprinkled cake, fairy dusted cake. best snack cake, tiffin cake. hahahaha. i laugh at the incident now but i am sure it must have been the scariest incident in ur life. ur little one is really cute.. :-) love this cake. looks so tasty.. perfect for tea time snacking..
oh my! This looks gorgeous! Thanx for visiting my blog ,dear..you too have a yummy space..cake looks delicious..will visit frequently, hoping to see you in my blog too!! I loved reading about your cute kid and to tell you the truth I am very clear about my coming future scary days with my son...;)..Cake looks delicious..
your writing is beautiful with so much depth. My brother has once locked himself in the bathroom the same way because he got mad at my mom .. he was 4 yrs old ! This cake looks lovely and stone fruit are all over these days. Wow wonderful cake looks so tompting and inviting too. You baby boy is a sure charmer! This fruit cake reminds me of Christmas in Kolkata.Sayantani you are making me home sick!! Tea cake looks awesome.. I can relate to the scary incidents so well.. reminds me of fun time I had with my girl... Good that both of U are safe.. Wonderful writeup Dear, very nice read..
lovely tempting and attractive cake allow me to just grab it will U? We love all stone fruits and here in delhi we get all of them plenty...but i seldom bake a cake with them all together. With peaches i made a bread and that was great. You kido is sweet , i remember my sis had locked herself once...must have been a hilarious thing to talk about for you all. I can understand why you would like to bake this cake again and again, I feel like grabbing a bite myself. Well your boy is indeed a crowd puller but the day you got locked in must have been scary, may we have more stories about the mishti little fellow. Cake looks superb n loaded with yummy fruits...looks perfect n nice clicks..
thanks dear,for your feedback,so glad that you like it..
Lovely looking cake. I am sure it will taste great too..very tempting :)Love your photos too. Enjoyed reading about your son :) This cake looks amazing. Loved the clicks too.. This cake looks real tempt!! I have never dared using flaxseeds..but now that you have tried, I shall do it. Did you have any flaxseeds bits in your cake? Just wondering if it would work with regular sponges. Locked in bathroom for an hour..Gosh!!! @Amritha, thats was real scary. @Reshmi, yes better you be prepared dear. they grow up in no time. Sangeeta, peach bread, plz share the recipe. @Shilipidi, truly that was an wonderful cake. @PRiti, I actually coarsely ground the seeds myself so it was not very fine. i have seen very fine flax seeds powders in the market, if you use that you wont feel any bits. but in my case I liked the nutty flavour especially when mingled with the almond meal. but am really not sure about using flax seeds in sponges. the texture definitely should change. lets check the net to see if anyone has done that before. Looks absolutely yummy! loved ur presentation and clicks! IT is funny reading the incident and it must have been very scary! The though itself is petrifying.. The cake looks delicious and lovely clicks! Tea cake looks soft, spongy, yummy and tempting. Very beautiful decoration and presentation. First, your little one is really sooo cute (love the pic with the laptop) even if being locked must have been so scary! Your cake looks awesome and I, too, have just discovered flaxseeds or chia seeds as eggs replacer! A great find, loaded with omega 3!! I think cakes gets soggy around the fruity bits because of the juice of the fruits bringing lots of moisture, so I think it is a normal thing! That cake looks absolutely amazing and wow what great stories about your sonny boy, locking in the bathroom doesn't sound too good, I can only imagine what you were going through. Once my nephew had locked himself in the bathroom and we didn't have a key from outside and he started crying and it was a hell for next couple of minutes. The cake looks awesome, am not much of an eggless bakes person too. I got to bake something with stone fruit before the season ends. And beautiful pics! Cake looks very scrumptious, Sayantini. The last click is tempting. Your blog is welcoming me with cake. :-). Nice writeup too. Cake looks very yummy. BTW I like your profile pic! You know something like this happened with me also two years back. While watering my plants my son locked the door from inside, after much pleading he tried to open the door but with little success. Then help came after 20 minutes later. I'm yet to try peaches in baking goods. But this looks gorgeous !! Pabda mach amader barir khoob kavche 'HAL' market e pawa jaye. Khoob hi fresh. First of all I simply loved your styling and the colors, brilliant! The fruit cake too looks delicious, especially with the cherry garnish. Wow!, I couldn't help notice that your teapot, matches the table cloth which you put in picture for the Jack fruit seed chops. I love the table cloth and the beautiful teapot. thanks for sending it to the event. I love reading about other people's children. This start looks gorgeous- love your blue plate! Thanks so much for entering monthly mingle this month! chk out my spcae for this months Event on Berries...hope to see soem of your recipes....and a chance to guest host too!